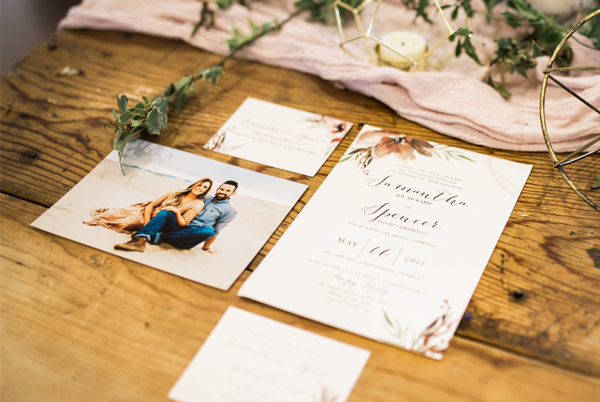 At Utah Announcements, we believe custom wedding invitations should be affordable for everyone and simple to create. We work hard to have the best prices and best customer service for your custom wedding invitations. Here are the steps to get started! Invitation inspiration can come from anything and anywhere! We recommend you start your search by looking through Our Portfolio and Pinterest board. If you find a design or invitation detail on another website, you are more than welcome to send us links. Together we will create your perfect wedding invitation using the design and notes you provide! All design consultations will easily be done over the phone and through email. Once you find your design inspiration, it’s time to gather the information that will go on your invitation. 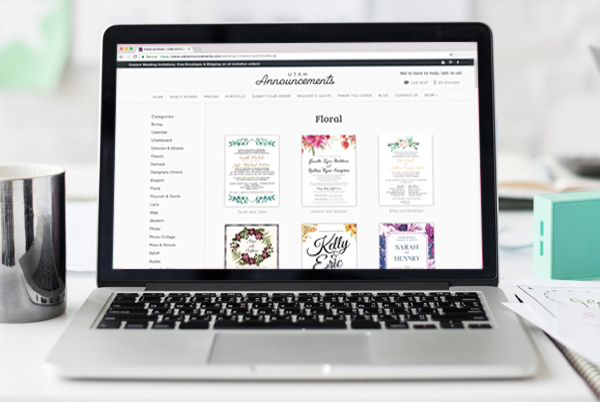 Our simple order form walks you through this process, from entering dates and wording to selecting how many invitations you want. You can also attach links to designs you like, helping us gather your inspiration and content in one place. Once the Order Form is complete, simply add your contact information and place the order. No payment is required when you place your order, this will come in step 4. Our talented invitation designers have done wonders for brides and they will do the same for you! The design process typically takes a week and is done entirely through email. 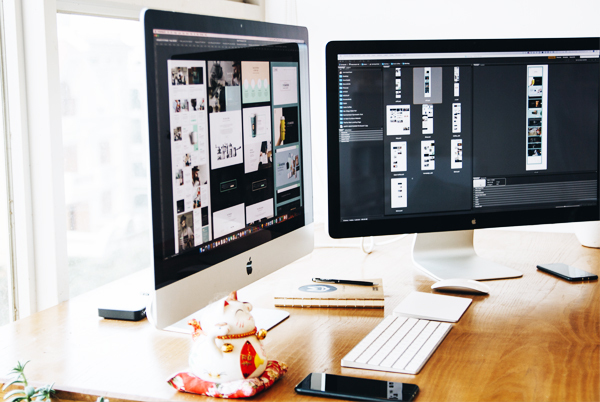 Your designer will reach out to you with a few first drafts based on your invitation inspiration and work with you directly to make any changes or adjustments. Once you give your final approval on the design you will finalize all your quantities and information with our office staff. “…I thought of the announcement process as being a stressful thing; it ended up being a lot of fun! The design process was great and my designer was so friendly! ” – Julie T.
We print on 130 lb, premium card stock with a matte finish. Once your design is finalized, we will confirm the order with you over the phone and collect payment. The standard printing turnaround time is 4 business days and orders are shipped UPS ground out of Utah, which takes 1-6 business days depending on where you live. Click here to estimate how many days your delivery will take. (Utah is typically next day delivery). 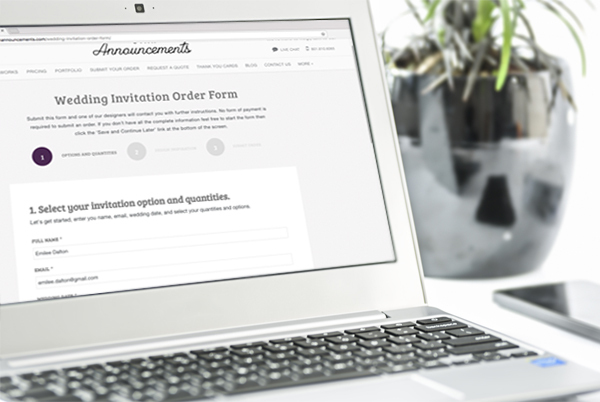 If you need your invitations sooner, you can rush your order for $50 (learn more). If you need a guaranteed delivery date, you can upgrade to UPS 2nd Day Air for an additional cost. If you are looking for a particular card stock or paper finish, please contact us; we have many options to choose from!